The Rubik's Tangle is a fairly simple sounding puzzles. Arrange 25 puzzle pieces into a 5x5 square so that the coloured ropes on each piece match up to adjacent pieces. Thus far, it has proved to be the most difficult Rubik's puzzle I've encountered so far - and the only one that I've had to resort to writing a program to solve. Unfortunately the Rubik's shop doesn't seem to stock the original Tangle anymore, but they do have a similar, simpler puzzle. The number of possible arrangements can be fairly easily worked out. The 25 pieces can be arranged in any order - but two pieces are identical. Each piece can be rotated in one of 4 orientations. Each permutation shows up 4 times as a rotated version. So that's 25!/2 * 425 / 4 = 2.2x1039 different permutations. Or about 2 thousand billion billion billion billion! 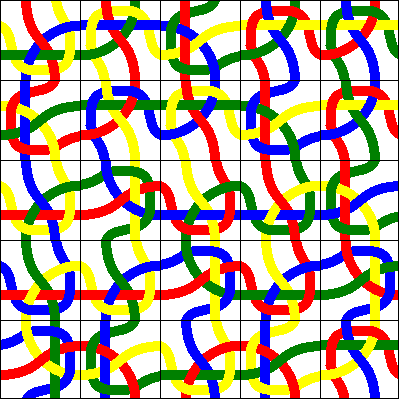 The solver works by using an algorithm similar to how you'd try and solve it by hand. This reduces the number of steps tested down to just 10,000,000, which is pretty easy for computer to check. Here's one of the solutions the program finds.